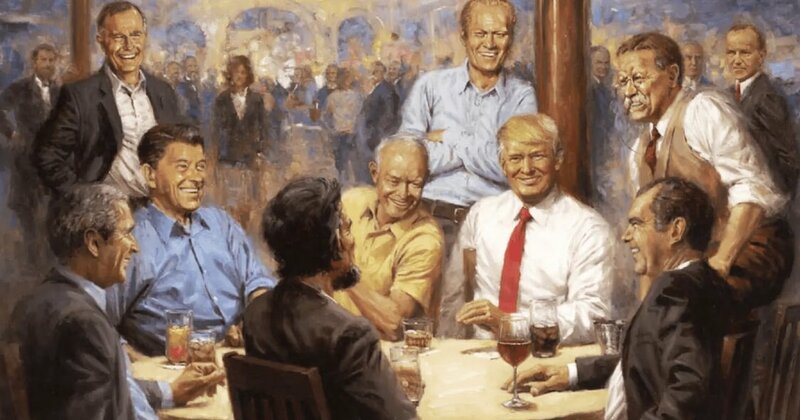 Donald Trump has made a striking addition to the White House’s art collection – a painting of himself hanging out with Ronald Reagan, Richard Nixon and Abraham Lincoln. And Eisenhower, Roosevelt, both Bushes, Ford. I must admit, I originally mistook the depiction of Eisenhower to be Jimmy Carter, till I realised no Democratic presidents were included. I doubt any past Democratic president would want to give Trump the time of day, but I suspect few of the Republicans would, either. Maybe Nixon would recognise a fellow conspirator, an appropriate companion to Trump in a portrait, but the rest of this GOP gaggle, while many did some bad things, weren’t odious human beings, and most would gag at the thought of being included in this… god what is the appropriate word? Travesty? Pastiche? Den of thieves? The thunderous noise you hear is not a hurricane or tsunami. It’s past GOP presidents spinning in their graves, if they’re in ’em, or having a conniption fit if they still aren’t. Ingsoc, by the way, is a reference to the totalitarian party running Oceania, in George Orwell’s “1984”. Seems a long way in the past now, but past is but prologue to the future. Orwell may have been mistaken about time and location, but he made a lot of sense. Newspeak. Newspeak is the official language of all party members, as the purpose is to eliminate all thoughtcrime. The mutability of the past. Newspeak doesn’t really apply to Trump. He can barely express himself in oldspeak. He uses English like a foreign language because he can’t think coherently. But the other two… now that’s a different kettle of fish. Doublethink is the ability to hold two contradictory ideas in your head, and fervently believe that both are true. Or simple denial of inconvenient facts. That is Trump all over. For example, his belief that he won a huge victory in the 2016 election, despite losing the popular vote to Hillary Clinton. Or that his inaugural crowd in the Mall was the biggest ever, despite photos showing it to be smaller than Obama’s. As for the mutability of the past, this is Trump’s favourite. It means he can lie about anything that happened in the past, deny it ever happened, and miraculously, because of his powers as Trump, president or whatever, the past changes! What was becomes fake, what is Trump’s fantasy becomes the new Truth. 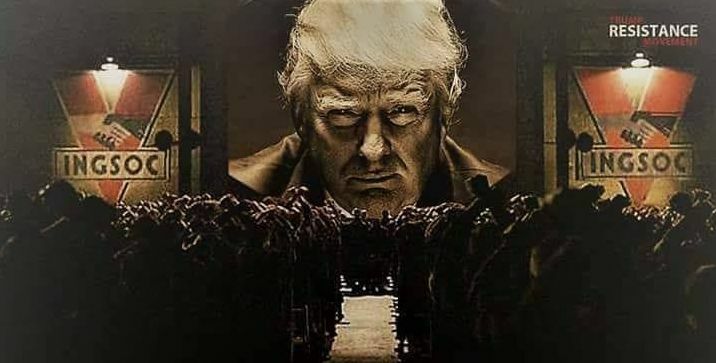 The man is a monster, and he is perfectly capable of devouring the US if Americans don’t stand up to him. I’m not optimistic. The entire Republican party has caved in to Trump. There is not a single sitting member with any honour or integrity. So it’s up to Democrats to bring this would-be tyrant down. To do that, they need votes. It’s going to be a tense three weeks.